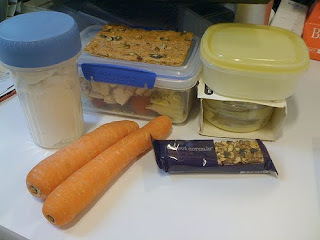 I pack lots of food when I go to work, to keep me going throughout the day; alongside a big plastic box with dry munchies like beef jerky and pistachios which lives in my desk drawer. I eat -lots- throughout the day and it all needs planning, packing and keeping from leaking, breaking, stinking or making a big mess in general. So here's today's haul. You can see a a pot with 3x hard-boiled quail's eggs in it, wrapped in kitchen towel to protect them; a Dr Karg crisp-bread that miraculously didn't break; 2x carrots, one Dorset Cereals berries and cherries bar; one tub of cottage cheese to go on the crisp-bread; one tub of Waitrose houmous with about 1/3rd left in it to go with the carrots; and a box of salad with lettuce, cherry tomatoes, roasted chicken and Food Doctor Herb Boost. What you can't see is the shaker with whey protein powder in it for after my weights session. Good haul, eh? My gym session today was slightly awesome! Someone was using the only pair of 12kg dumbbells (oddly, there are multiple sets of every other even numbered weight except for the 12s), so I had to use a 14kg one for my squat with swing. Then I decided that my side-planks with rows needed a bit of a boost, so I used a 5kg dumbbell for that instead of the usual 4kg one. And I pushed out 3x10 on the clean and press as well as 2x 5 negative movement pull-ups (OK they were definitely not all 4 seconds long, ohhh no, but still I tried!). Adding in those pull-ups tips the balance on the timing so I've cut the cool-down on the cross trainer to only 2 minutes instead of 5 or so at the end but still managed the usual stretching on the power plate. Good session! I (and my team) moved desks in the office today, right down to the other end of the building, so... there were cakes. So I had a tiny one; a Thornton's Caramel Shortbread thing which was all sticky in the warmth and really really sweet. Thankfully, dinner was quite light: chicken breast wrapped in 2 slices of chorizo and on a bed of mashed butternut squash. I overcooked the squash a bit so it was really soft and gooey when it got mashed :o) Lotsa black pepper on top and scoffage ensued! Slight oopsage in that when I got home I fancied wine. So I'm sipping wine right now, and it is nice. We'll see how much I end up having, it depends on how I feel and how nice it is (and it is nice!). OK, so if I drink wine today I won't lose as much fat as I wanted to this week, but hey, I feel good at the moment and I'm not -too- fussed about losing fat really quickly. 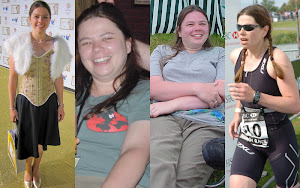 Of course I have to look fabulous at a couple of weddings later in the summer, but that's only the icing on the cake of being fit and feeling stronger than I have ever felt in my life. I think I might have got the muscle back now that I lost while losing loads of weight 4 years ago. It's taken a year, but it's back and I feel great! Its great that your feeling so brilliant with your fitness! I'm glad I'm not the only tubberware queen, I always go to work with a bag full of little plastic boxes full of stuff!